Is Europe ready for another huge brand new class cruise ship? Well there’s no choice as Aida Cruises upcoming Aidaprima will become the cruise lines largest and most innovative yet. The Carnival owned cruise line Aida Cruises ordered a huge cruise ship that is now in its final phase of construction. The Aidaprima which will be a new generation cruise ship for the German cruise line is under construction by Mitsubishi Heavy Industries (MHI) in Japan. The ship will be the largest ever built for Aida Cruises and will be purpose-built for the German market where it will sail from Hamburg, Germany all year round towards the end of 2015. Cruise Hive has come across one of the best cruise ship time-lapse videos ever! This videos shows the full construction process of Aida Cruises upcoming cruise ship Aidaprima. The video shows stunning views and camera angles as its being built-in Japan. 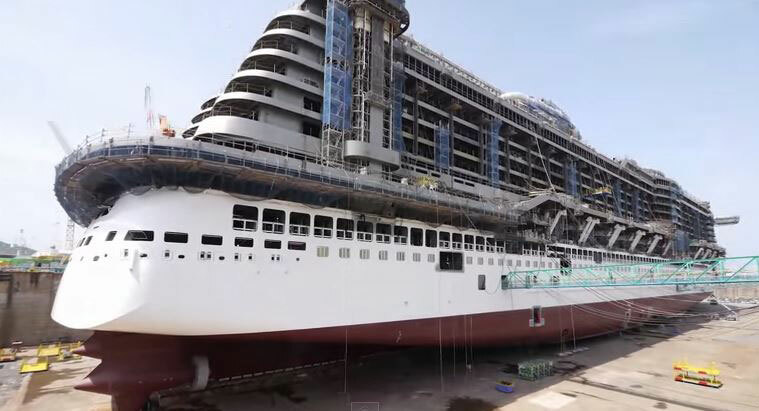 This video is a great insight to cruise ship construction. Aidaprima will bring new construction technologies thanks to the japanese shipbuilder and will take the cruise line into a new era of cruise ship design. The large vessel is set to bring many new onboard features including the UV-transparent Foliendom so passengers can relax under palm trees no matter what the weather is outside. You can read about some of the first features announced by Aida Cruises in a previous report. Aidaprima will set off on her maiden voyage from Yokohama, Japan to Hamburg, Germany in October 2015. The voyage will be cut in half with the fist part lasting for 50 days to Dubai. the ship is 125,000 gross tons and once sailing will carry over 3,000 passengers.